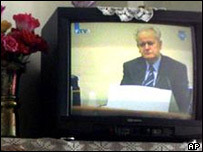 In Serbia and Montenegro the trial of Slobodan Milosevic leads every news bulletin. One TV station is even providing a continuous feed of the events in the courtroom. But ordinary Serbs are ambivalent about the case. Many never want to hear the name Slobodan Milosevic again, let alone spend their days watching him defend himself on TV. But that does not mean they are fans of The Hague either, a foreign court they see as being far too allied to the Nato forces that bombed Serbia in 1999. A recent opinion poll suggested that three quarters of Serbs believe the Hague war crimes tribunal is a political institution biased against them. At best, there is a lack of trust. "The whole idea of the Hague tribunal is in my opinion bad and a just court solution would be here in Serbia, not in The Hague," says one young man. His friend says: "Many people support the generals who are hiding from The Hague here and I think whoever is in charge of this country would have problems delivering them to The Hague." "Milosevic and Saddam are the only presidents in the world who are facing a political trial," adds a third man. At the Belgrade office of the Independent Criminal Tribunal for the former Yugoslavia, they try to convince the Serbian people that The Hague is both fair and necessary. But the facts show how hard a job that is. ICTY representative Alexandra Milenov says: "The government of Serbia and Montenegro is responsible for arresting and transferring all accused who are located on its territory, and according to the information of the prosecutor there are about 15 accused. "Unfortunately there hasn't been an arrest in just about a year, and there have in fact been very few arrests at all. Twice ICTY has written to the authorities to ask for an update on arrests and we received no response whatsoever." Throughout the Balkan wars Serbs were fed a diet of propaganda that portrayed them as the innocent victims of others' aggression. So when Nato bombed Serbia in 1999 many were shocked, and it still colours attitudes towards the West, and The Hague itself. Vladimir Krsljanin, an activist campaigning for Slobodan Milosevic's release, says: "The court is not impartial. We don't consider it a court of justice but as a political tool of the Nato governments. "If not, why did it fail to launch even any investigation into the crimes committed in the Nato aggression against Yugoslavia in 1999?" One of those who has called for closer co-operation with The Hague is Serbia's President Boris Tadic. He knows that many of his countrymen disagree with him. In a recent interview with the BBC he said: "From my point of view there's no doubt we have to co-operate with The Hague tribunal. "I have to say that we were victims during the last century. My family was a victim of ethnic cleansing in World War II. "But for me it's completely unacceptable for my people to have been involved in war crimes. This is a huge problem: to explain to our people that we have to face our war crimes. This is because of us. We need a new way of thinking." But that new way of thinking is slow coming. 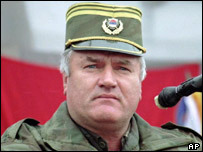 One of Europe's most wanted men, Bosnian Serb General Ratko Mladic, is widely believed to be hidden somewhere in Serbia and Montenegro. Deadlines for his handover - and that of others - arrive, and pass. Slobodan Milosevic is not much of a hero in Serbia, but when he attacks Nato and the West, it is a spectacle that many here enjoy. And they know it may get yet more interesting, particularly if Mr Milosevic gets to question Bill Clinton and Tony Blair themselves.